​Compare Sling Bookshelves for Kids: ECR4Kids or KidKraft? Getting children excited about reading isn’t always a simple task, but using a sling bookshelf, you might actually be successful! Indeed, because sling bookshelves are designed so that books can be displayed by front or back cover instead of the spine, children are able to see the book covers in all their beauty, with all their attractive pictures and colors clearly visible. Children being children, this can easily attract their attention and tickle their interest to discover what is between the covers and start reading. These bookshelves are designed to accommodate items of almost any size including hardcover and paperback books, magazines, folders, and more. The front-facing shelves make it fun for little ones to find what they’re looking for, and also make it easy for them to put their books away when reading time is over. ​Some of these shelves are even equipped with storage compartments in their back or on top where toys and other stuff can be hidden away. They can be very useful not just at home but in particular in classroom environments. Note that these book shelves are only suitable for children 3 years an older! 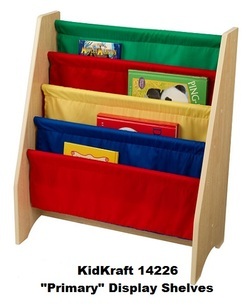 This article will compare the best ECR4Kids and KidKraft sling bookshelves for kids. More specifically, we will compare ECR4Kids ELR-17013, ECR4Kids ELR-0335, ECR4Kids ELR-0339 and KidKraft 14221/14225/14226 sling bookshelves. At the time this article was written, these were the most popular brands sold on Amazon and had received excellent reviews from most Amazon buyers (an average of 4.5 stars each out of 5 stars!). ECR4Kids ELR-0335 has shelves on both sides, 10 shelves in all. ECR4Kids ELR-17103 has 5 storage compartments on its back where toys and other stuff can be hidden away (see image above). 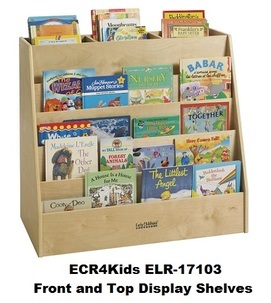 ECR4Kids ELR-17103 has also storage a compartment on its top (see image above). 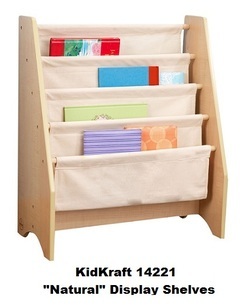 All ECR4Kids sling bookcases are made completely from birch. The frame of the KidKraft bookcases are made of MDF and the shelves of canvas. MDF stands for Medium-Density Fibreboard. It is an engineered wood product made by breaking down hardwood or softwood residuals into wood fibres, combining it with wax and a resin binder, and forming panels by applying high temperature and pressure. MDF is generally denser than plywood. ​The Amazon prices shown were in effect at the time this article was written and may have changed. For exact prices, please refer to the Amazon products section below. Note that the Amazon price often includes a generous discount to the list price. If a discount exists, both the Amazon price and the list price will be displayed when you click the Amazon product link images below. So which of these sling bookcases to buy? 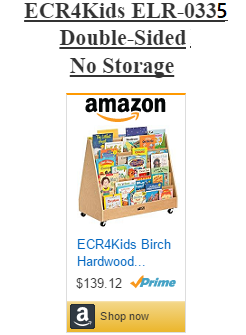 ECR4Kids sling bookshelves are quite a bit more expensive than the KidKraft bookshelves. This is mainly due to the fact that they are made complately of sturdy durable hardwood (birch) that will last for a lifetime. This also explains why they come with a lifetime warranty. So, if you want something that will stand all sorts of harsh environments like in classrooms or if your kids tend to be quite active, you should definitely go for one of the the ECR4Kids units. Note also that some of the ECR4Kids units have storage compartments not found on the KidKraft units. On the other hand, KidKraft sling bookshelves display some features that you may find attractive: Though they have no storage compartments, some models allow displaying books on both sides of the bookcase, they all have soft canvas shelves that may protect books from getting damaged, and they are quite a bit less expensive. 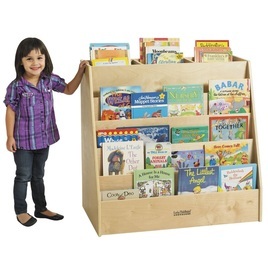 But, whatever brand or whichever model you choose, these bookshelves can be the perfect gift for the young readers in your family and make reading and story time a lot more fun. Please click the sling bookcase of your choice below for price information or to purchase.